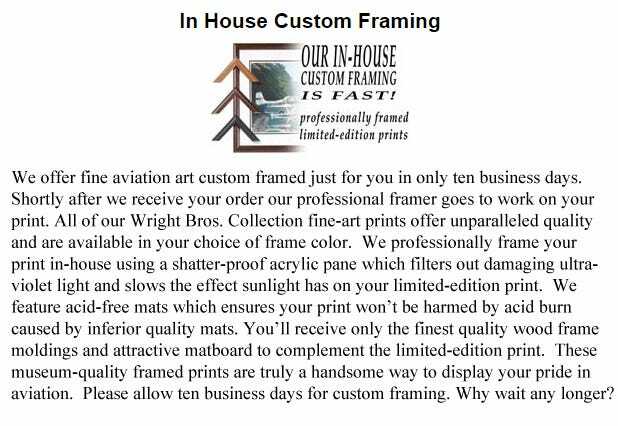 We are pleased to offer this Limited Edition Flying Tiger Print created by aviation artist Roy Grinnell exclusively for the National Aviation Hall of Fame in Dayton, Ohio. In a brief ceremony on the airfield at Kunming, China, on 4 July 1942, the legendary American Volunteer Group-better known as “The Flying Tigers”, disbanded and turned over its shark-faced fighter planes to a new USAAF combat unit, the 23rd Fighter Group. It would be the job of the 23rd to assume the AVG’s responsibilities for defending the Burma Road and skies over Free China from the Japanese. By the end of WWII, the 23rd Fighter Group had swept the China skies clean of Japanese aircraft. The 23rd went back into action during Operation Desert Storm in 1991, flying the A-10, and continues to operate to this day. 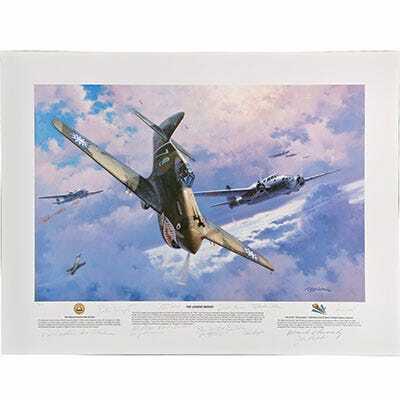 Each print is accompanied by a Certificate of Authenticity and comes numbered and signed by the artist along with 14 Flying Tigers (signatures vary).Print includes a free one year membership to the National Aviation Hall of Fame. Print measures 23” x 30” (unframed).